Inspired by the Salt Tray post on Teach preschool website, I spread salt on a cookie tray and let CJ to play. She enjoyed the Salt Sensory play. She had fun writing on the salt and making impressions. For more info on Salt Tray please visit Teach preschool site, Deborah and her class made hand prints, cookie cutter impressions in the Salt tray. In the post, Deborah also has Salt tray tips from one of her reader. After playing with the salt tray, we also made salt prints and Raised Salt art. We created a snowy day and Spring pictures. First I was thinking to just cover the surface other than the tree trunk with Salt and complete the snow scene. But CJ said "Why Mommy the trees and bushes will also have snow"
I left her to come up with her own snow scene. CJ applied glue randomly on the sheet. After that, she placed the paper on the salt tray with the glued side facing down the tray. Remember our Sand prints and Stencil Sand art, this time we made Stencil Salt art. Prepare your work area. May be u can put a newspaper beneath to catch the salt spill. Place the stencil on top of the paper. Pour little amount of glue/mod podge onto a disposal plate or yogurt cup lid. Remove the stencil. Sprinkle salt onto the glue covered area. Lift the artwork and pour the sand off onto a container/paper. Dip paint brush in water and then in water color paint. Make sure the brush is covered with paint and water. Tap the salted glue with the brush and watch the colors run and spread! Apply Glue to the leave stencils and sprinkle salt, shake off excess. Paint the raised salt. The Problem with this method was that the salt falls on the wet salt painting and makes the picture dull. So in the other method we made the raised salt painting first and then painted it. Using Stencil and glue, first create the entire picture with sprinkled salt. 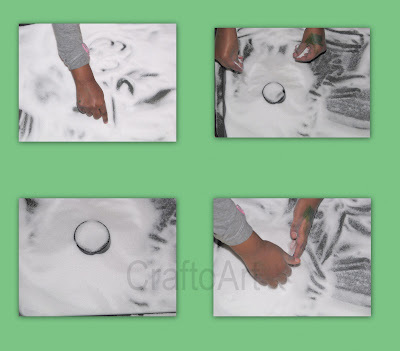 The Raised salt art is an inexpensive science and art experiment. CJ was going Aah! by seeing the paint spread on the salt. that is soo neat! we are going to have to give this a try! I love the way your stencil picture turned out! What a great idea! How pretty!! I will definitely have to try this -- I've been wanting to try a salt sensory tray for a long time now. Thanks for the reminder! :-) LOVE the idea of stencils for this! This is so lovely Esther...loved Cj's creation. This is great! I really like the raised salt spring piece. I'd love it if you'd link up to my linky party at www.becca-homeiswheremystorybegins.blogspot.com. I write three blogs; my homelife blog, kindergarten blog, and literacy blog. I know you're a child centered person, so if you'd like to check them out, you can find links to all three at www.homeiswheremystorybegins.com. Hope to see you soon! Glad I found your blog!